Unless Ricky Gervais is hosting drunk and ripping on Hollywood celebrities, there's still no better awards show than the WWE Slammy Awards. 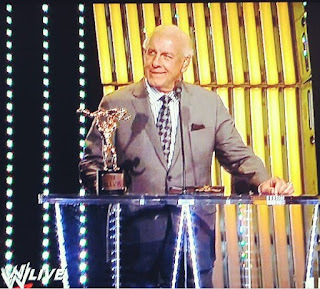 This year's featured the return of Ric Flair to WWE, which is enough to give this show a thumbs up from me. But a bunch of other ridiculous stuff happened too. I hung around to watch Monday Night RAW live and tweet through the whole show. Like the Slammys and WWE in general are these days, my tweets are unapologetically AJ Lee-centric. WHAT A GREAT NIGHT! THANKS TO ALL MY LOYAL FANS! SO HAPPY TO BE HOME! Looking back on 2012, it's really incredible how much @wwe invested in @wweajlee. Most prominent Diva not named @trishstratuscom or McMahon. @backofthehead @wweajlee also took her opportunity and ran with it. She put in huge amounts of work. No wanted it more than her.